Enchanted Excurse: Don't Turn Strigoi! Evenin' Loverlies! Last week my husband and I got a stomach bug! YUCK! I hate stomach viruses, I'd rather have a sinus infection it's that bad. lol Sheesh! My tummy is still a bit wonky, but I'm better THANK the Lord!! So saturday we decided to treat ourselves to a movie. 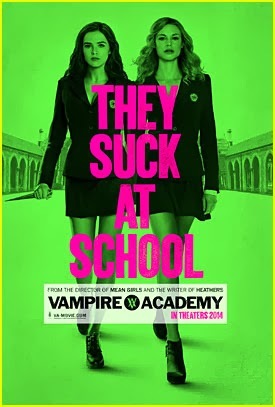 Yes, we went and finally watched Vampire Academy!! I LOVED IT! I love the books so much, it is such an interesting story about vampires. Vampires in this story are called Moroi. Then you have their guardians called Dhampir. Dhampir usually have a Moroi father. Something like that. lol. The Moroi don't kill the folks they drink from. If they do they become Strigoi, once Strigoi they lose a bit of themselves and of course become evil. They are even stronger! I love how they stayed pretty decently with the book. I did find it odd that Queen Tatiana and Dimitri were older looking then I pictured. lol They had to grow on me, but I think they are pretty decent choice to portray them! I am excited for the next movie! I love it better then Twilight, and the Twilight series were good books. I don't know if I would like being a Dhampir or Moroi. I think I would want to be a Moroi that learned to fight physically, because I love that they have magical powers also. Magic is just fascinating to me. lol It was an awesome movie. I suggest reading the books and watching the movie. I have the last book left to read. So anxious to read it but I have to finish another book I am reading at the moment. I need to do a book review on it as soon as I'm finished. :) In other news I finally got another dresser for the other bedroom. I am so blessed and grateful the Lord allowed us to be able to afford one. lol Might sound silly and little, but I'm excited about furniture! Especially when it is needed! Thank You Lord!! I hope all of y'all are well and had an awesome weekend! Ta Ta For Now!